When deciding who might receive financial assistance, The Board of Ryan's Reach relies primarily on the recommendation of High Hopes Executive Director Mark Desmond. After a family interview with Mark, he is in the best position to determine their need and ability to pay. Mark, in turn, presents scholarship requests to the Board. After evaluating various factors, we provide a number of scholarships for six-month intervals. At this time we are privileged to provide scholarship assistance to the listed High Hopes students. Joseph is a 56-year-old senior pastor, who suffered an AVM stroke. Every year in California there are over 20,000 strokes, may leave with long-term cognitive and physical issues. Joseph is supported by his wife Mary and their 8 children all helping Joseph recover his life. He began High Hopes unable to transfer, move his arms, walk, or stand. Joseph could not speak or express his needs. Joseph today due to, God’s support, your support, hard work and High Hopes he is now able to stand, walk with assistance, use his arms and hands. 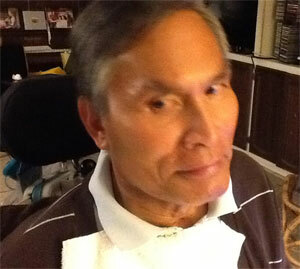 Joseph can also speak with a low voice expressing his needs and thankfulness for all the support. Your support makes High Hopes possible for our family. Thank you! On July 28, 2002, our life as a pastor and his family took a sudden detour while he was practicing for a church tennis tournament on the courts at Cerritos Regional Park. Collapsing from a heart attack, that robbed him of oxygen for over 15 minutes (in spite of being surrounded by skilled nurses administering CPR), began our journey into the world of brain injury. Our faith in God gave us the strength and encouragement to navigate the multitude of challenges that lay before us, especially during those first few weeks. Providentially, an extended family member saw Ryan Corbin's story on the Larry King show shortly after, and encouraged us to contact High Hopes. One visit showed us that this was the place for Mel, because they would work with someone who could not follow commands or "showed little chance of improvement." It took a couple more months to get details like a custom wheelchair and transportation worked out, but our much awaited first day came that December. The caring staff and director Mark Desmond made our initial hours there welcoming and comforting, and gave Mel and I both something to look forward to in the midst of a still very confusing situation. Today, fourteen years later, we continue to anticipate each of our days there with the same "high hopes!" We are so very grateful for this high caliber program that would be out of reach for us if it were not for the scholarship assistance we receive from Ryan's Reach, especially as our personal resources have diminished through the years. We see Ryan's Reach and its founding members' vision for providing hope to students and their families as truly the calling and gift God has given them, and we are thankful for their faithfulness in carrying it out in our lives and the lives of many others. And to those of you who have participated in that vision by contributing, our sincerest thanks as well. May God continue to bless you and this work! Mother's Day four years ago was a defining moment for my life, my family's life, and, most of all, my daughter Shanin's life. I got the call no mother ever wants to answer and my world was knocked off its axis. On May 12, 2012, Shanin was found by the side of the road in Oakhurst, California. After being airlifted to Community Regional Hospital in Fresno with a massive brain injury, the doctors were insistent that the prognosis wasn't going to be good. Emergency surgery was performed to remove part of her skull so brain pressure could be relieved. Shanin was in a coma for over two months and I honestly didn't know what to expect—or even if she would live. As if dealing with these life-threatening injuries weren't enough, the police were conducting an investigation to deduce the cause of the accident. Without going into details, Shanin was a victim of a crime that couldn't be proven. The case has since been closed; no justice has been served. The doctors in Fresno said she would remain on a trach and a feeding tube the rest of her life and would probably be a vegetable. After 10 months, Shanin defied all odds and pulled out the trach herself. Two years later, she pulled out her feeding tube and is now eating real food—even spoon-feeding herself when she's in the mood! Since June 16, 2012, Shanin has been in a long-term care facility in Orange County, has had her bone flap replaced, and has been receiving therapy. Shanin's recovery really kickstarted in September 2012 when I met Lindy Boone Michaelis at the Dove Dash, a fundraiser for Ryan's Reach. Lindy educated me about High Hopes, a brain trauma recovery center, and I felt Shanin really needed this kind of attention. She was accepted and began attending High Hopes in December 2013, which wouldn't have been possible without the sponsorship and generosity of Ryan's Reach. My family and I are forever grateful to this amazing charity. She has made tremendous progress at High Hopes and has come further than we ever hoped or expected. I thank God every day for the living miracle and reminder that Shanin is to me and everyone she meets. We are so blessed by Ryan's Reach and how they have tremendously helped Shanin - and continue to do so. On Sunday morning August 20, 2006, our family changed forever. Garrett was 18 years old and had just finished high school. As a high school quarterback he showed skills that could get him into college. He was ranked 15th in Orange County and had plans on being a quarterback at Fullerton JC. Like many young adults, Garrett was very reckless when driving a vehicle. He was driving home with a couple of friends. His truck was estimated at 85 mph while weaving in between other cars. Garrett lost control of his truck and hit the curb. That made the truck go into a roll. The cab airbags and seatbelts did save his life, but the accident wasn’t over. The truck continued to travel until it hit a telephone pole. That’s when he was ejected out of the truck. Garrett sustained a brain injury that required an emergency surgery. He had bruised the right side of his brain and had 9 cm removed. He also had both lungs collapse, his left arm was cut to the bone, and his nose was broken. We spent 2 1/2 months in ICU. After Garrett was well enough, he went back into surgery to put the right side of his skull back on. While in recovery, Garrett had the first of seven grand mal seizures. After months of therapy at Healthbridge Rehabilitation and then RIO it was clear we would not be able to continue to pay for the rehab there. Then I was told about High Hopes. Without the Ryan’s Reach scholarship, it would not have been possible for Garrett to continue to get the help he needed to regain the everyday functions needed just to live. Garrett started to improve almost immediately when he arrived at High Hopes, and has continued to improve with the help from Mark Desmond and the entire staff. Garrett’s physical strength has improved from the various machines ( ie. quadriciser) as well as the High Hopes program at 24 Hour Fitness. Also, his cognitive ability has improved from the computer classes. The staff is a big part of Garrett’s improvement in building his confidence and self worth. We are so blessed to have a place like High Hopes and the financial support from Ryan’s Reach. Every time I go to pick up Garrett I make a point to say hello and thank as many of the staff as I can. Once again, Thank You! George had a severe stroke that led him to extensive brain damage. Debbie was a district trainer and very successful manager for Carl's Jr. Restaurant. She was highly regarded and very well liked. Everything changed when Debbie was in a car accident. She spent weeks in ICU and was in a coma for 5 months. Fernando, a young full-time student, was hit by a car while driving. Michael's dream was to be a police officer. He and his family were driving back home after a family outing, and they were struck by a semi-truck on the freeway injuring his whole family, sadly some of them perished. Bo, a football player, was injured on the way home from surfing at the beach. He was a passenger in a car when the driver hit a tree in the center divider of the road and he was ejected from the car. Ryan’s Reach is a 501(c)(3) charitable organization honoring the name of Ryan Corbin (Pat Boone’s grandson) who suffered a severe TBI, having survived a fall. Ryan’s recovery has been a miracle and encouragement for others. Although Ryan personally is financially secure, his entry into the world of TBI brought forth attention to the fact that most families are not as fortunate and a TBI wreaks havoc not only on their finances but on their loved one’s ability to recover.